What most excites you about this year’s JDF Cup tournament? Seeing the kids enjoy themselves and all for a good cause. I’m looking forward to it because last year was an amazing turnout, the kids really enjoyed it and everyone had a great time. Each year we want to improve on the previous year so this year will be even bigger and better. What does the JDF Cup mean to you? The tournament isn’t just for turning up and having a kick around. It’s for changing lives. When you’ve been blessed in life and you’re in a position to give back, it’s important to do that. As an athlete, giving back is just as important as playing and doing what you do. I can stand there at the tournament and feel as though it’s a proud moment. I get the same feeling and buzz from giving back and changing lives, the same way I get a feeling from scoring a goal in the world cup. The kids at the tournament have such talent and they can come and enjoy the day and hopefully it’s something that can be ongoing for many years. Do you remember the first tournament you took part in? I remember, for Senrab I used to play on Sundays in the league and in the Summer we use to do the 5 a side tournaments. I always loved the 5 a-side tournaments as it’s a smaller pitch the tournaments gave us the chance to win a trophy. I always wanted to win the golden boot. I think just like wanting to win the world cup or the world championship, tournaments give you the chance to achieve something. Being a premiership footballer, you have taken part in uncountable tournaments but there must be one that stands out in your mind. Which one would you say it is and why? The World Cup in South Africa. 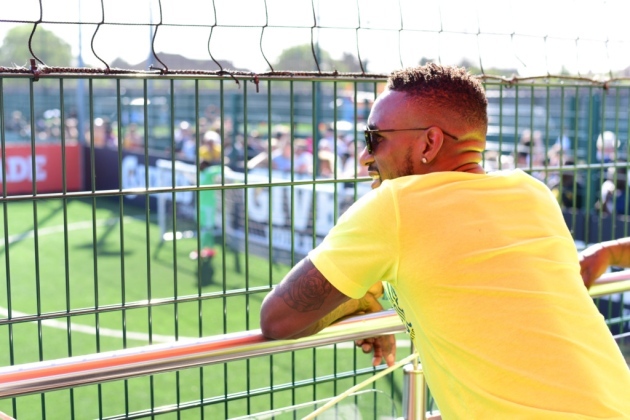 It was a massive World Cup and for me personally, I’m a massive Nelson Mandela fan so to go to the World Cup in South Africa and take part in that was really special. A lot of players go to tournaments or World Cups but they don’t get a chance to actually kick a ball there. I was lucky enough to be able to play and score a goal. I played in the squad against Slovenia and it was a really important win. Because I was so far away from England I didn’t really realise how big it was at the time, but the country went crazy. What is your advice to budding footballers? You have to work hard. There’s a lot of players that may have talent but they don’t want to put the effort in. You have to be willing to do those things that other people aren’t prepared to do. The difficult parts like getting up in the morning, training in all weathers, training on your own sometimes. Even now I do altitude training where you have to push your body to the limit work hard and always practice. You need to dedicate yourself. It’s important to look at the bigger picture when you are making sacrifices. Making sacrifices like going to bed early, eating well, not going out when other people do I’m so glad I made the sacrifices I did. If you’ve got a passion and you want to be successful, you have to be willing to sacrifice and put the work in. Being 35 I’m one of the oldest in the club and still playing, you have to keep sacrificing all the way through and keep working hard. Growing up, who inspired you and why? My idol was Ian Wright, I always wanted to meet Ian Wright. I had the posters on my wall, it was sort of like an obsession. Years later when I signed my first professional contract for West Ham, he was the first person I saw when I stepped into the building. It was crazy. Imagine being a kid admiring someone and wanting to be like someone so much and then that happens. I don’t think it’s a coincidence, it shows things like that are meant to be. Wrighty was the one who used to stay with me after training and teach me certain things. He was definitely my idol. In your opinion what contributes to making a good football team? The spirit of the players, the team spirit. No egos but just things like being able to click in the changing rooms. You become a family. You’re with these bunch of people every single day of your life and you become close. That’s why the best teams are successful. Apart from your love for football, what are three other things you value in your life? Family. When you’ve got your family around you growing up like your Mum, Dad, Nan, Grandad, brothers, sisters, cousins and as you get older you meet your partner, those values you’ve grown up with stick with you. Managers such as Alex Ferguson when he was with Man United, he used to know every player and all the parents from the U7s to the U8s and U9s. You need good people around you to support you as a football player. Your health is important. I always wake up and I know its cliché but I thank God that I’m healthy and breathing. When I’m healthy, I believe I can do anything I want to and the sky is the limit. When I know I’m healthy, I have that hunger inside me and I can do anything. The third thing is ambition. Family and good people around you, healthiness and ambition all work together and you can do anything you want to. Who are the top three artists on your current playlist? I’ll have my bottle of water and green tea. I’ll be busy getting involved in the games and the tournament, I’ll definitely pick at food where I can but I won’t be eating any meat. For music, Chris Brown… Tekno and finally Rick Ross. I like a lot of old stuff too. Oh, and Drake! Some would say that it’s important for children to be involved in a regular sporting or creative activity; what do you think? It’s definitely important. not just football but any sport, it brings people together. There’s a lot of stuff that’s going on at the moment on the streets. Activities like this football tournament provide a way of everyone coming together, even if they were strangers before. That’s the beauty of sport, not just the people playing but the people supporting and the fans, all are a part of it. What and who would you say has contributed to the. success you have gained in your football career so far? My Mum. I say that because she saw it from day one. When you’re young and someone calls you special, it’s hard for you to understand that as your dream feels like such a long way away. But my mum always told me I had something special and told me I would go on and make it. When I see a child doing something and they say it’s their passion, I will push them all the way and give them everything. 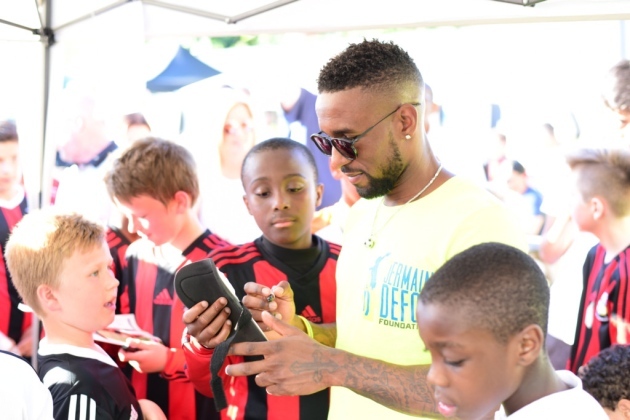 The Jermain Defoe Foundation is a UK-based charity that will work with the government and existing organisations in St Lucia to improve the lives of young people on the island.